Thursday provided Americans with an exceptionally rare political moment. The House of Representatives voted unanimously on an issue so fraught with partisanship that opposing sides are generally unable to remain civil, much less agree on anything. 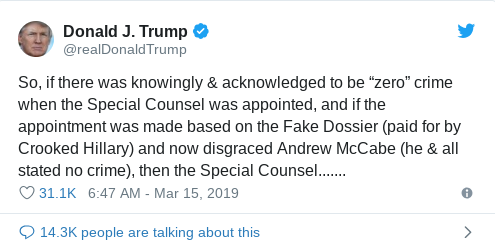 But on a non-binding resolution designed as a message to Attorney General William Barr, the House voted 420-0 (four Republicans voted present) to make special counsel Robert Mueller's much-anticipated report public. It was a symbolic measure that was immediately blocked in the Senate by Lindsey Graham of South Carolina, who says he believes Hillary Clinton hasn't been treated with the same investigative zeal as Donald Trump. (The fact that she has not held public office of any kind since 2012 has apparently escaped his notice.) Graham needed to soothe Trump's bruised feelings after 12 Republican senators managed to resist his mighty negotiating skills and voted with all 47 Democrats on a measure to roll back Trump's border wall "national emergency." No doubt Trump's House henchmen knew that Graham would step up to defend the president, and therefore felt free to pretend they care about transparency. Still, it was probably a good thing to get all those Republicans on the record. It may well be something they come to regret. Waiting for Mueller is turning into a rolling national anxiety attack. For the last few months there have been a number of reports that the investigation is coming to a close and that Mueller is getting ready to close up shop. So far, it hasn't happened. We have also learned that various members of the team have either been reassigned or are planning to move on to other jobs. On Thursday the special counsel's office confirmed that Andrew Weissmann, the prosecutor who handled the Manafort case, is leaving, which set off even more speculation that Mueller is getting ready to turn off the lights. It that's true, we don't know yet whether more indictments may be coming, or how much Mueller has handed off to other prosecutors for follow-up. We do know that Roger Stone's trial has been set for November, so if Mueller is moving on, someone else will be handling it. And the U.S. attorneys in the Southern District of New York seem to be pursuing a number of investigations that are at least tangentially related to the Mueller probe. The Wall Street Journal reported this week that SDNY prosecutors have requested emails featuring some pretty damning "pardon" talk between former Trump lawyer Michael Cohen and another lawyer who created a "back channel" to Trump's current personal counsel, Rudy Giuliani. That, suggesting that they may be interested in whether or not Trump and his associates sought to obstruct justice in that case. So there's a lot of evidence that criminal investigations are ongoing, even beyond the Mueller probe. Adding all this up, it does appear that we are reaching some sort of crescendo. If Mueller is done, the assumption is that he will write up the results of the investigation and send it to the attorney general, who will then decide if he wants to send it to Congress. Legally, Barr has total discretion at that point: He could send the report as written, summarize it in some form or just lock it up in a file and never show it to anyone. 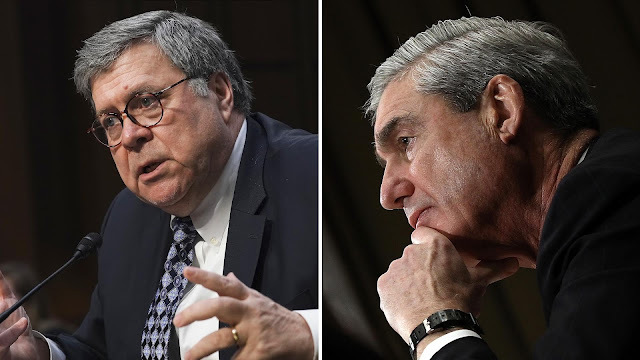 Considering the Justice Department's policy holding that a president cannot be indicted, and since the Justice Department typically does not air out the evidence against anyone who has not been indicted, Barr could easily rationalize such a decision. House Intelligence Committee chairman Adam Schiff, D-Calif., said on MSNBC that he was prepared to do whatever is necessary to see the report and also get access to the underlying evidence, including calling Mueller to testify and going to court. But he has an ace up his sleeve that he isn't talking about. A couple of weeks ago former SDNY prosecutor Nelson W. Cunningham, who served as general counsel of the Senate Judiciary Committee when Joe Biden was chair (and was also a White House lawyer under Bill Clinton), wrote a piece for the Daily Beast in which he clarified that the "Mueller report" is actually two reports. Recall that some time back we learned that the FBI had opened a counterintelligence investigation into whether the president of the United States was a Russian agent -- knowingly or otherwise -- and that that investigation was then folded into Mueller's mandate. 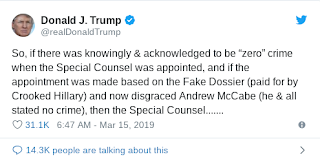 As I noted at the time, former acting FBI director Andrew McCabe made quite a point of that during his book tour, even describing how he briefed the Gang of Eight congressional leaders about that decision. If you wondered why McCabe thought that was so important, this may be the reason: Counterintelligence investigations must be reported directly to Congress. Done well (and Mueller and his team seem to do everything well), it will provide a much richer, broader narrative description of Russia’s effort to interfere in 2016, the nature of any links or cooperation between the Russians and the Trump campaign, and whether Trump or his associates were witting or unwitting assets for the Russians (including by obstructing the investigation) — as well perhaps as conclusions for action. The Mueller case at heart is an intelligence case. So what does that mean for the report, the content and the access Congress will have to it? It means that the House and Senate intelligence committees, because at it's a CI case, are going to be able to demand a briefing on results and significant developments ... . I'm telling you, Adam Schiff may have more power than anyone else to get the most out of that Mueller inquiry and get the most transparency. So I think, intriguingly, the most sensitive part of the case may be the way Congress gets the most insight into it. When Schiff says he will bring Mueller to testify, I'm guessing that this what he's talking about. It might take place behind closed doors because the counterintelligence report is likely to contain classified information the public cannot see. But if Mueller is clever and Schiff is agile, they should be able to create a narrative that can be shared with the public about what happened (and is still happening) that is not subject to Department of Justice restrictions. This evidence will almost certainly inform the House leadership's decision on impeachment. Who knows, it might even be enough to move a few Republicans to do their duty.